With 35 rooms set in the heart of Alaska’s wilderness in Wrangell-St Elias National Park, the Kennicott Glacier Lodge overlooks twenty-five miles of glacier and is bordered by fourteen of the continent’s highest peaks. 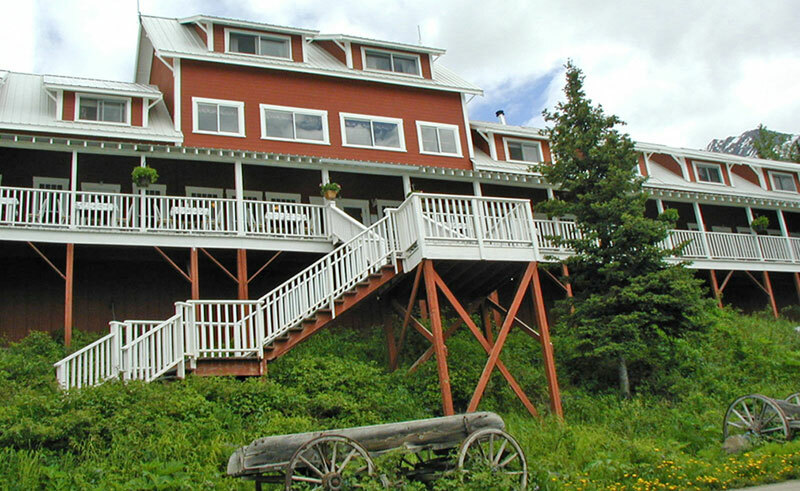 Family-owned and featuring gracious hospitality to augment the breathtaking views, this lodge is a replica of one of Kennicott’s historic mining buildings, complete with photographs and personal items of many of the miners. Offering 25 guestrooms with shared bathroom and 10 with en suite, all rooms have unparalleled views of the surrounding wilderness. Two living rooms are well stocked with books and games while the expansive front porch provides panoramic views of the Chugach and Wrangell Mountains. Daily after dinner, a local guide provides a slideshow, complete with pictures and information about the wilderness and history of Kennicott. Accessible by bush plane from McCarthy, this property is for those who want to get into Alaska’s true wilderness and offers a spectrum of outdoor activities, such as glacier hiking, zip-lining, alpine hiking and river rafting.